Microwave couplers are devices which divert a fraction of the signal on one transmission line to another transmission line. The signal exiting the output port of the first transmission line is called the “through” (sometimes called the “direct”) signal since it is directly connected to the input port and the signal exiting the other transmission line is called the “coupled” signal. If the coupled signal is traveling in the same direction as the through signal, the coupler is called a “forward-wave” coupler. If in opposition, it is called a “backward-wave” coupler. Because these coupled signals are related to the direction of the through signals, couplers are called directional couplers. The circuit based couplers are generally not called directional couplers even when they have identical S-parameter matrices. Perhaps this is because the “through” path is obscured by the circuit element interconnections. Also, if the outputs of the coupled and through ports are equal in amplitude, the coupler is called a hybrid coupler—I don’t know why. Couplers are incredibly useful components and are found in almost every microwave system in use: radars, radios, test equipment, medical equipment, communications equipment, cable entertainment systems, radio telescopes, TSA scanners and garage door openers. Here is the icon for the schematic representation of a coupler. In this symbol the through line is depicted as the line connecting port 1 to port 2 and we have used the convention of naming the ports in a clockwise sequence. Don’t be confused about the port numbering, the symbol represents any coupler—forward or backward. There are two ways of designing couplers: one using coupled transmission lines and the other using interconnected circuit elements consisting of independent transmission lines and or “lumped” elements like ideal capacitors, inductors, resistors, and transformers. The network coupler derives its performance from its circuit elements and their interconnections and not from any coupling between transmission lines. Since this is microwaves101 we will not be discussing the lumped element versions because for microwave frequencies these lumped elements are frequently used to model the behavior of physical structures used in microwave circuits. All coupled-line based couplers are both directional and quadrature couplers and are four-port circuits. The fourth port is called the “Isolated” port in contrast to the input, coupled, and through ports. Note that sometimes an apparently three-port device is called a coupler when its fourth port is terminated by the characteristic impedance and hidden by the packaging of the device. Symmetrical couplers based on coupled lines are designed for uniform coupling over the quarter of a wavelength region where coupling takes place. These couplers tend to have about an octave bandwidth depending on the coupling level. Asymmetrical couplers are quite different and usually have variable coupling between the two transmission lines. These couplers can have quite wide bandwidth—greater than 28:1. The symmetrical coupler bandwidth can be increased by the addition of extra quarter-wavelength coupling sections but this maxes out at about 10:1 bandwidths. While there are only two basic types of coupler design, there are an incredible number of manifestations of these design concepts. Once you understand the basics, you can invent your own version of a coupler because all it requires is for you to select some transmission line structures (not necessarily the same as each other) and arrange them in such a way that some portions of the two structures are not isolated from each other and that, over some distance along the lines, the fields and waves of one line interact with the fields and waves of the other line. That’s it. The devil is in the details and you are free to manipulate these details until the structure performs as you wish within the confines of your imagination and the difficulty of building it. Before going into detail about various coupler structures, let’s define some of the performance parameters that will be used to define how well each structure performs. For this purpose we will use the nomenclature of the schematic symbol for a coupler, assuming a backward-wave coupler. Two additional characteristics used to define coupler performance are phase unbalance and amplitude imbalance between the coupled port and the through port over the operating frequency band. 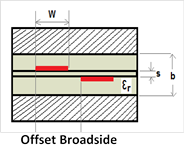 Both characteristics are used to define the bandwidth of the coupler. Note that these numbers are supposed to be positive in dB. Quite often, microwave engineers present these quantities as negative numbers, it is not a great faux pas. The earliest directional coupler is generally credited to H. A. Affel of ATT whose U.S. Patent 1615896 was filed in 1922 and granted in 1927. 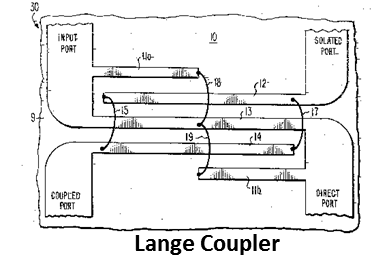 The illustration from the patent is shown below and appears to be a two wire transmission line coupled to another two wire transmission line. Shown next to it, doing pretty much the same thing, is a pair coaxial lines joined together with a portion of their outer shields removed to allow for coupling. In the 1940s at the MIT Radiation Laboratory, a wide variety of waveguide couplers were invented and characterized, including the Bethe hole coupler, multihole couplers, and the Schwinger coupler. In the 1950s coupled TEM line directional couplers were designed by a group at the Stanford Research Institute primarily using stripline transmission line structures. Next came microstrip couplers which were planar and open-sided which made it convenient to mount semiconductor and other devices. The popularity of these designs was hastened by their low manufacturing costs compared to waveguide couplers. Currently, great strides in new microwave materials and fabrication techniques as well as new computer-aided-design tools for layout and circuit simulation including 2D and 3D EM analysis programs are giving you the opportunity to revise and improve on existing coupler designs as well as to create entirely new families of designs. Flexible substrates, low-loss substrates, multilayer substrates with vias, semiconductor substrates, substrates with thermal expansion rates matched to semiconductor devices, micro-machined substrates, and metamaterials provide additional options for innovative designs. Let’s look at a collection of couplers based on coupled lines. All of these structures can be modeled using the even and odd mode technique for analysis. Hence, all symmetric couplers based on uniform coupling between two transmission lines over a single quarter-wave section have a closed form center frequency solution based on their even and odd mode impedances— and . 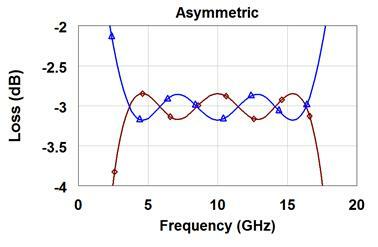 The coupling section length is a quarter-wave long at the center frequency and the system characteristic impedance is . Let C be the desired coupling in dB and the corresponding coupling factor k = . The conditions necessary to meet the desired performance at the center frequency for a lossless coupler are expressed in the following equations. 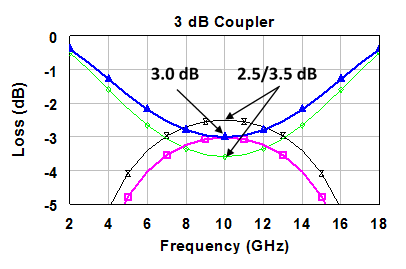 Now let’s plot the response for two versions of an ideal 3 dB coupler: one with exactly 3 dB coupling at the center frequency and one with 2.5 dB coupling at the center frequency. If you define bandwidth as the frequency range for losses in the range 3 +/- 0.5 dB, then the 3 dB coupler has a bandwidth of approximately 7-13 GHz and the 2.5 dB coupler has a bandwidth of 6-14 GHz. Clearly it’s important to pick your center frequency coupling target with the bandwidth in mind. Also note that small changes in the even and odd mode impedances result in significant coupling changes. If you would like to use a different coupling factor to find the even and odd mode impedances needed to create a coupler with the coupling of your choice and to see a table of its frequency response, we have a handy calculator for that purpose. Just click here to start the fun. Notice also that I have only shown the response from 2 to 18 GHz. The coupled lines are a quarter-wave long and as such the lossless response at 10 GHz is identical to that at the 30 GHz (the 3rd harmonic) and, in fact, to that at every odd harmonic. Most of the time the additional losses that occur at higher frequencies will impair the upper pass band resonse but beware. Here is a sample of the transverse cross-sections of some of the popular coupled-line couplers plus the layout of some variants of uniform coupling. Illustrated below are three primary examples of network couplers: the branchline coupler, the rat race coupler and the magic Tee coupler. The rat race hybrid and magic Tee hybrid both provide in phase and 180 degree power splits and the branchline coupler is a forward-wave quadrature coupler. The rat race and magic tee couplers are generally narrowband and unlike coupled-line couplers or branchline couplers cannot add extra sections or more magic tees to increase the coupling bandwidth. Recently, C. F. Marki, v. D. Kodwani, F. A. Marki have devised a new kind of Magic-T circuit composed of a balun and two parallel coupled transmission lines which has already exceeded octave bandwidth performance using suspended substrate, broadside coupled lines—the balun tends to be the bandwidth limiting element of this coupler. Asymmetric couplers are quite different and usually have variable coupling between the two transmission lines. These couplers can have quite wide bandwidth—greater than 28:1. Tapered asymmetric couplers can be quite compact. A special class of asymmetrical couplers consists of interconnected coupled lines with uniform coupling in each quarter wave section of the coupler. While each section is a symmetrical pair of coupled lines, the overall coupler is asymmetrical. The differential phase response of the asymmetric 3 section coupler is not in quadrature and is relatively linear with frequency instead of constant with frequency since it is an asymmetric coupler. At the center frequency the coupler has quadrature phase. 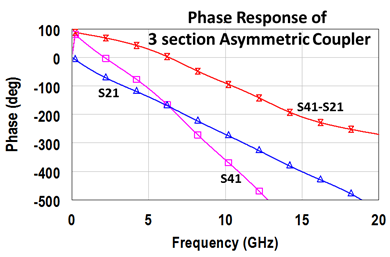 The addition of phase compensation transmission lines can flatten the phase frequency response around the center frequency at the expense of additional line loss and increased size. Do I Really Need a Coupler? Sometimes you just want to share an input signal between two other transmission line ports. While all of the above couplers can do this, there is a collection of microwave circuits called power dividers that might be more convenient than the coupler circuits. One of the most widely used versions of a power divider is called the Wilkinson power divider. We will look at power divider circuits (or splitters if the division is equal) on another page. 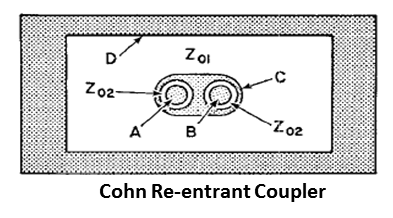 Here are a collection of microwaves101 pages that continue the discussion by providing additional information and design details for most of the coupler design approaches mentioned earlier on this page. Click here to go to our even and odd mode analysis page. Click here to go to our main page on couplers and splitters. Click here to go to our page on directional couplers. Click here to learn more about multi-section symmetric couplers. Why does the coupled-line have a natural 90 degree phase split? Look on this page. Check out the Lange coupler.